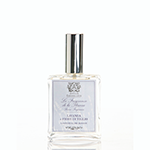 Antica Farmacista's Lavender & Lime Blossom Room Spray is a soft yet sparkly fragrance fusion built on pure lavender from Provence. Bright notes of French verveine add an uplifting citrus component to the legendary lavender scent, known to calm the senses. A subtle floral infusion of crisp lime blossom rounds out this lovely fragrance.